Once again, Apple fully sponsored the collection and recycling of Minot State University's electronic waste. This year, 19 pallets with an estimated weight of 20,000 pounds was collected. The e-waste was shipped out today (Aug. 11), from the new facilities building heading for Sims Recycling Solutions in West Chicago, Ill. The e-waste was collected by Information Technology Central and Office of Facilities Management staff from offices and departments across the campus. The process reduces MSU's environmental impact, diverting the materials from the landfill. 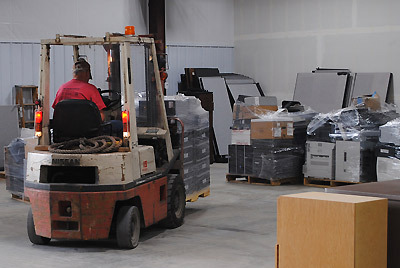 Certification of destruction and recycling is provided yearly when the process is complete.